"This is a great salad to take to a barbeque. All ingredients are approximate, so add more or less of any ingredient depending on your own taste." 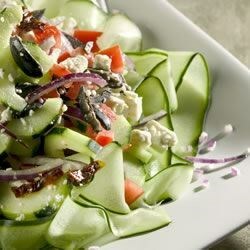 In a large salad bowl, toss together the cucumbers, feta cheese, olives, roma tomatoes, sun-dried tomatoes, 2 tablespoons reserved sun-dried tomato oil, and red onion. Chill until serving. This salad was okay. I thought it might be better if I made it a day before, but it turned out to be soggy. I didn't seed my cucumbers, and I added a tablespoon of good quality balsamic vinegar just to pick it up a little. This is exactly what a Mediterranean Greed Salad should taste like.